During the 1960's, the Japanese racing scene was striving to catch up with high performance racing machines of European origin. One manufacturer called Prince developed the first Japanese prototype racing machine, named the R380. With a powerful-in-line six cylinder DOHC engine mounted amidships under a low and sleek body, the R380 won the 1996 Japanese Grand Prix race event and established several world speed records in the following year. 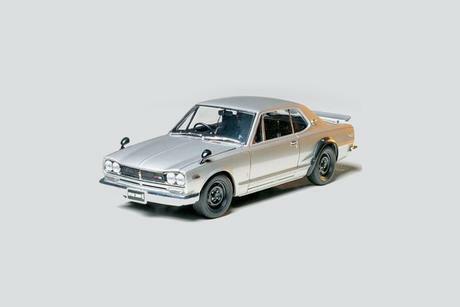 The Prince company merged with Nissan, and unveiled a special 4-door sedan Skyline model during the 1968 Tokyo Motor Show. Priced at almost double that of other Skylines in the stable, it was transplanted with a de-tuned powerplant of the R380 racer's unit. This hot-blooded Skyline was launched into the market in February 1969, under the designation of GT-R. The 1,989cc DOHC 6-cylinder S20 type engine yielded 160hp of maximum output. In October 1970, the original 4-door sedan GT-R was replaced with a more sporty, 2-door hard-top model. Its designation "R" stood for racing, the Skyline GT-R virtually dominated Japanese racing circuits from the late 60's to early 70's. The 4-door and 2-door Skyline 2000 GT-R's accomplished 50 respectable victories in domestic races during that period, establishing the famous "GT-R legend" among the Japanese motor racing enthusiasts.